Our custom screen rooms and roll shades allow you to enjoy your outdoor space in a comfortable environment. We'll help you bring the outdoors in. All of our products are custom built and tailored to your home’s design and specifications. Our designs will feel like they were meant to be a part of your home. We are 100% Austin Texas based & proudly serve all of Central Texas, including Round Rock, Bastop, Georgetown and Driftwood. 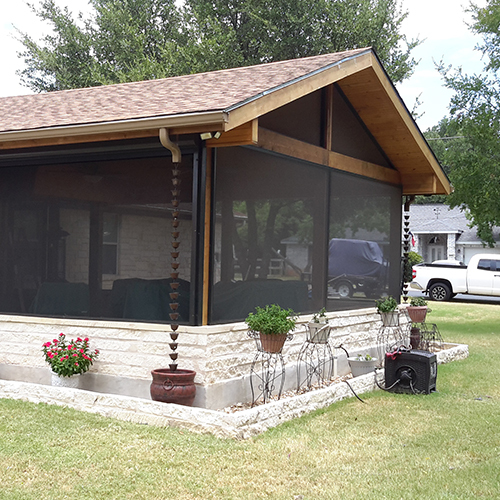 Our family owned business proudly brings innovative, aluminum screen rooms and roll shades to the Central Texas area. Our products are built to last, stand up to high winds and rain and come in a variety of colors to offer endless years of enjoyment. We will give you a call to discuss the details of your project. Screen room, roll shades, or other. Any additional information about your project. Feel free to address any questions or concerns you may have.